I can’t believe it’s already been a week since I posted! Anyway, the topic of discussion on this blogpost is Saturday 27 March 2010. I didn’t realize that my younger sister (Adila) was at school that morning, or that my other younger sister (Aniza) was going to her friend’s birthday party later, or that Adila had to leave for her piano lesson at the same time that Aniza had to leave for the birthday party. And my younger brother (Ashraf ) was having friends over to do a school project. Everyone had plans except me! Anyway, after I sent Adila home, I rushed around Taipan, desperately looking for parking due to my lack of double-parking skills. I think I must’ve circled the triangle like 10 times. I knew that I was supposed to buy Aniza’s friend two big Cadbury bars. So I thought to myself, I’ll take the biggest bar I can find. I couldn’t find anything even remotely reasonably-sized. I didn’t have enough confidence to drive myself to Cold Storage, since I’ve never tried to, nor do I know how to go anywhere else. 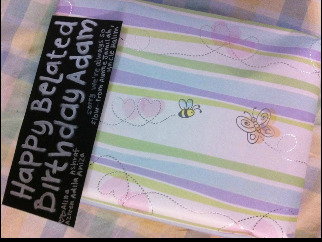 So I hoped that by some miracle guardian would have something gift-worthy. I just took two 4-square-wide bars because I knew I couldn’t waste anymore time. There was no present, and it was time to get wrapping. So when I arrived home, I was so relieved that (my mom made a meal in advance before leaving in the morning) there was plenty in the fridge to eat for lunch. It was almost one and I’d left everyone at home starving. I would’ve liked to bring everyone out, but I was quite broke, grandma would’ve suffered with her knee pain, it was already late, and actually I don’t think they would’ve liked to anyway. So there I was feeling so proud as if I wrapped Wirdani’s present so nicely that I didn’t realise that it was 2.45, and with one car, I was supposed to already be headed to USJ 3 and/or Pizza Hut Taipan. So, what time is piano class? okay. Aniza, what time’s the Wirdani’s party? and her twin brother’s birthday! 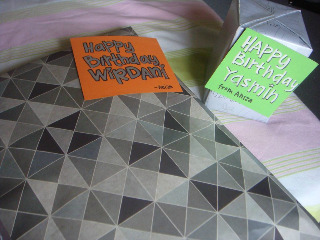 And the present was wrapped as one, and I wrote Wirdani’s name really big on the card. So later, at 4 while I was struggling to remember where I had just sent Adila only an hour earlier. I realised that Teacher Yvonne’s house is situated in a really high-traffic area of USJ. And the guards already have to deal with a flood of people going in and out, and now i’m supposed to feign some interpersonal skills and not come off as a total creep who shouldn’t be allowed to enter USJ 3 ever again. After about a million and a half wrong turns later, I got to Adila 15 minutes late, but thankfully she was okay about waiting. And, it turns out Aniza had so much fun, there was pizza-making and go-stand-in-the-freezer and ice cream cake and everything! *Wants Wirdani’s (and/or her twin brother’s) life* It was 6.15 and her parents were still waiting downstairs for parents to pick up the remaining guests. So I had hoped that my shift for the day was finished, but the house was a complete mess and I hadn’t touched the mop, vacuum cleaner, etc. in ever in my life. And to this day I still haven’t. So clearly my pay being docked (or rather voided) doesn’t go without reason. Just be thankful that you’re allowed to drive, Azreen.